Is methane a ‘better’ greenhouse gas than CO2? Methane is in fact a more efficient greenhouse gas than CO2, but there’s so much less of it that the overall effect is much lower. Methane’s contribution to the greenhouse effect is only about half or less that of carbon dioxide. It was actually a nice post, but it persuaded me to do this. Several commenters there have felt the need to do “back-of the-envelope” calculations on the relative strength of each gas to the overall greenhouse effect by trying to crunch together “how much more potent” it is (20-25 times seems to be the popular number), and by figuring in how much more CO2 there is in the atmosphere than methane. One Don Healy tried to calculate the temperature difference caused by changing CO2 by dividing two numbers representing the final and initial CO2 levels and multiplying by 33 C. None of these methods are correct, but there are a few issues raised– which gas contributes more to the overall 33 C greenhouse effect? How do changes in one gas compare to changes in another gas? Is there some “intrinsic property” of methane that makes it better than CO2? To compare the relative “efficiences” of each gas I went to David Archer’s MODTRAN simulation under a cloudless, water-free atmosphere devoid of any other greenhouse gases aside from CO2 and CH4. 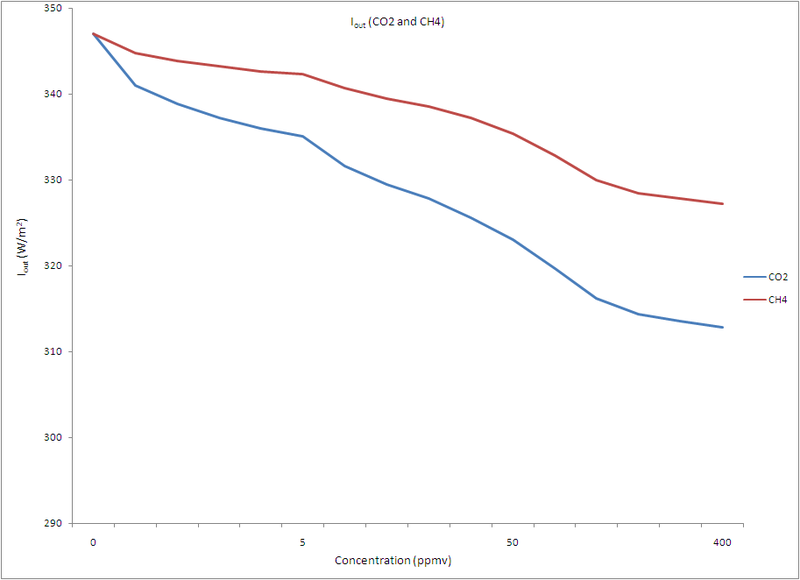 I then plotted the Outgoing radiation as a function of concentration for each gas (click for larger image). Please note that both concentrations are in parts per million for a proper comparison, whereas methane is usually measured in parts per billion. Also note the scale on the x-axis which moves quickly from very low concentrations, to much higher ones (way too high for methane, close to modern day for CO2). As you can see, CO2 is actually much more efficient than methane at cutting off the outgoing longwave radiation. That is, intrinsically speaking, methane is not as good a greenhouse gas than carbon dioxide. If we introduce just one ppm of each gas into a greenhouse-free atmosphere, the OLR for CO2 drops by 6 W/m2 while the OLR drop for methane is only 2.2 W/m2. Methane actually intercepts outgoing radiation in a place on the spectrum that is less well-placed than that of CO2, for Earth-like conditions. In terms of the absolute values for the 33 C greenhouse effect, CO2 contributes to roughly 20% of that (see Table 3 in Kiehl and Trenberth 1997), while the other trace gas including methane do not even contribute half that combined. This is indeed because there is a lot more carbon dioxide in the air than methane, but why then do we say that methane is so much better a greenhouse gas? The answer is that people are comparing the end of the CO2 curve in the above graph (at 380 ppm), to the very start of the CH4 curve (at 1.8 ppm). Because of the logarithmic behavior, clearly the one with lower concentration will be “better” when you add a little bit more. This behavior arises because of the “saturation” effect on principle absorption bands. The strongly absorbing part of the spectrum is not yet depleted for methane, while for carbon dioxide you’re adding absoprtion in relatively weak regions. Under modern concentrations, introducing a few parts per million of each gas would indeed favor methane in terms of “forcing effect” by almost a factor of 30. Another issue is residence time. Carbon Dioxide has a lifetime in the atmosphere of roughly a century, with at least a quarter of the extra input sticking around for much longer. In a well-oxygenated atmosphere, methane oxidizes into CO2 quickly so it’s hard to build up very high concentrations and the “extra pulse” of methane lasts around a decade. If the concentrations were reversed, and CH4 was at 385 ppmv, and CO2 was at less than 2 ppmv, then the popular idea would be that CO2 is a much more potent greenhouse gas. There is nothing “special” about methane that makes it much powerful than CO2, this has more to do with the abundance of each gas in the present atmosphere. Methane is important though, and should be in the near future when it comes to global warming. It is currently is the second most important single forcing agent next to carbon dioxide for the 20th century warming. The other issue often associated with methane is catastrophic release from hydrates in the deep ocean. This would indeed cause an extremely large warming effect (Archer 2007 says 10% of that methane being released would cause an impact equivalent to 10x CO2). The residence time of methane also becomes longer at such higher concentrations. Though this is a problem that would take place on scales of millennia, and shouldn’t be an issue this century. This entry was posted in scientific basis. Bookmark the permalink. Mostly because CO2 absorbs right at the maximum of the IR emission from the earth and CH4 is out on the high frequency wing. You don’t have to really do the calculation to figure this out. Your MODTRAN simulations were with a water-free atmosphere. Does it make much difference if you start with a realistic amount of water vapour? What I am thinking is that any overlaps in the water and CO₂ or CH₄ absorption lines would distort the relative effects of those gases. I only wish elementary school teachers start to research the effects of methane. Gas is gas natural or not. Tobacco is natural but does that make it ‘good’ for you. Cows belch, and poop high methane because corn is their fuel. Oh for those who don’t know President Bush, the guy who could care less about the environment decided this should be an alternative. Why? Only because he did not want us to depend on Arab oil. Did he have his staff investigate the effects? I’ll leave that up to you.